After the election of President Enrigue Pena Nieto, a member of the Institutional Revolutionary Party (PRI), the indigenous revolutionary group focused in the south of Mexico, the Zapatistas, have broken their years-long silence. After a failed effort to unite the liberals and progressives in Mexico in order to close the widening schism between the wealthy and poor in 2006, the group had all but silenced themselves in the public eye. For the past twelve years, the National Action Party had been leading Mexico under presidents Vicente Fox and Felipe Calderon. However, the PRI saw the first uprising from the Zapatistas back in 1994, and they may see others because of several different tactical advantages. The Zapatista Army of National Liberaiton (EZNL) take their name from the agricultural revolutionary Emiliano Zapata. Many still wear the initials “E Z” on their clothing while marching. They are some of the most recognizable figures in recent Mexican history because of their ever-present black balaclavas and red bandanas tied around their necks. The social rights-focused collective started their campaign for a basic equality between Mexicans in 1994, when they took control of six towns in Chiapas, the southern-most province of the country. Despite “declaring war” against the Mexican government, they have mostly been involved in either non-violent or defensive efforts against the military, paramilitary, and corporate interventions in the province. Their most recent effort to unite a Mexican front across the entire country, the Other Campaign, attempted to mobilize a unified mentality in 2006. However, the project failed, and the EZNL had been out of the public eye until the recent statements. The Zapatistas’ ideologies line up with liberal socialism, with many elements of anarchism and Marxism thrown in, but they regularly reject political labeling, instead focusing on the unity of their Mayan ethnicity and repression. They also believe in the indigenous control of land and resources as opposed to a general socialist collective or government regulation. Since their inception, they have been garnering support gradually from the province still marred by a feudal mindset. 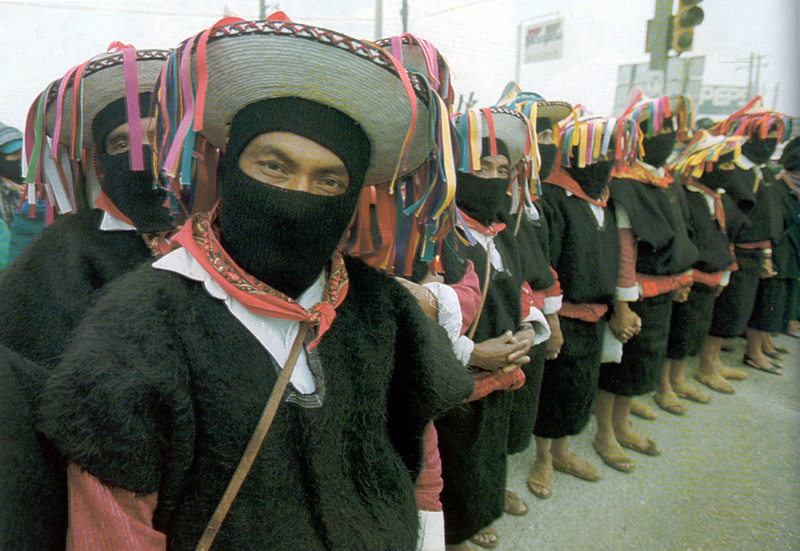 According to recent estimates, the Zapatistas have anywhere between 100,000 and 200,000 dedicated followers in tow. Back on the supposed end of the world day, December 21, 2012, 40,000 Zapatistas marched through the originally controlled cities of Chiapas: San Cristóbal de las Casas, Ocosingo, Las Margaritas, Comitan, and Altamirano. Many analysts of Mexican political and social trends believe that the new administration will only strengthen the resolve of the EZNL. After an election rife with alleged fraud and scandal, PRI took back power after twelve years of losses to the National Action Party. Before Calderon’s election in 2000, the PRI had held the office of president for seventy-one consecutive years. With the support of the United States’ aid of over one billion dollars, Mexico is basically militarizing their country in an attempt to curb the rampant drug violence perpetrated by the cartels and their enemies. While it would be difficult to deny the importance of that issue, it undermines the social issue that affects many Mexicans who feel that their government ignores their daily needs. The most prominent Zapatista, Subcomandante Marcos, provides much of the publicity and communications with the press. In his most recent statement, he said: “Our pains won’t be lessened by opening ourselves up to those that hurt all over the world. We will resist. We will struggle. Maybe we’ll die. But one, ten, one hundred times, we’ll always win.” One of the most distinctive figures in recent history, he always wears the signature balaclava and red bandana, but usually smoking a pipe astride a horse. Despite not having Mayan heritage, he still speaks for the movement and their developments. Since the group does not have a designated leader because of the general structure and beliefs of the EZNL, Marcos, also known as Delegate Zero during the Other Campaign, is merely a figurehead. That doesn’t prevent him from looking like a total badass, however. Analysts believe that the current efforts to unite many different social groups of Mexican groups to revolt because of mounting student protests against the newly-elected Pena Nieto. Since many of them disagree with the looming militarism coming to the country because of the drug war, they could be sympathetic to the Zapatistas because of the PRI’s initial attempt to squash the EZNL back in 1994 with violent action. However, students do not provide the only base of support for the group. Internet activists/hackers Anonymous recently overtook the webpage of Mexico’s defense department, pledging upcoming kinship with the Zapatistas. Further, while much of their focus is localized, they also have many global allies because of their early adoption of web-based support and activism, predating similar initiatives like the Occupy movement. The resurgence points to an increasingly complicated situation in Mexico, with many different factions attempting to accomplish different goals. In the future, the causes that will take precedence will point to the level of importance that the government and people give. Zaptistas stole it?? are you serious??? dont you think its the other way around?? Im assuming the misleading title is an attempt at satire for the sake of catching the public’s attention because Zapatistas have been using such tactics for decades. Sooo…. Toma guey!!!! !